This is a links style seaside course, totaling 36 holes with each 18 designed by a different person. It extends over slightly uneven terrain jutting into the Yellow Sea and surrounded on three sides by the ocean. The A Course is a full-scale championship course while the B Course is suitable for beginners as it is short and easy with few hazards. The entire A Course looks magnificent due to the natural coastal landscape, unique hill features and wonderful design. Some holes are built along the seashore, some greens are built on the cliff top, and some tees and greens are daringly separated by a bay. So, each hole varies and it is fun to play. The course is nicknamed as Golden Pebble Beach coming from Pebble Beach in California. A downhill par 3 with an elevated and shallow green. A bunker in front of the green is in play. A slightly uphill, straight hole. The tee shot is over a ravine. As it is a very long par 4, distance on both the tee and second shots is required to hit the green in regulation. The green is elevated and slopes steeply from back to front. A straight par 5 reachable in 2. Because there is a ravine about 60 yards in front of the green, you need to make a decision whether you go for the green or lay up in front of the ravine on the second shot. A “signature” par 3 with the sea on three sides with astonishing seaside scenery. It is awe-inspiring at first glance but is not so difficult due to the short distance. Still it tests not only a player’s skill but also his courage and luck. The green is some 20 meters (70 ft.) below the tee level. Set against the backdrop of the sea, and surrounded by the sea on three sides, this hole has all the elements for a great shot over the sea, with the green set on a cliff top or down by the seashore. Because the wide green slopes from front to back, a shot over the pin in order to avoid being short will end up with the ball in the rough at the back of the green. Strong sea winds and the small green means club selection is crucial on this hole. A 90-degree dogleg to the right with the ocean on the right. Trees on both sides narrow the landing area off the tee. The second shot is slightly downhill. You need to drive long enough to see the green on the second. The green is surrounded by hazards on three sides, so you need to hit directly onto the green and bite to avoid trouble. If you don’t have confidence on the second shot, you should play safe by laying up to the left front of the green is the only safety zone and go for 1 chip & 1 putt. A par 3 over a ravine with the ocean on the right. The sea view seen from the green is beautiful. An uphill hole with the ocean along the right. A slightly downhill hole toward the ocean. The tee shot is over a ravine. A left to right hitter needs to be careful as a deep bunker, a cliff and the ocean protect the right side of the green. A sharp dogleg to the left, a difficult hole. The left side of the hole borders a steep cliff which extends to the left and rear of the green. The second shot is over a steep valley to reach the other side of the cliff requiring skill and courage. 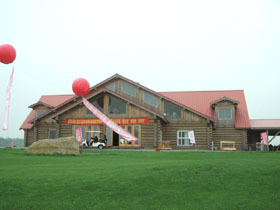 It is an hour drive from Dalian and a 70-minute drive from the airport. Anyone can play from back tees. It seems that you can’t usually play from the pro tees, which are the longest. Thanks to the consideration of the caddie master, I could play from them. Peter Thompson designed another course in China, Lake Malaren (上海美兰湖) GC. He is sometimes mistaken for Peter Thomson, the 5-time British Open winner. This Peter Thompson is American and Peter Thomson, the British Open winner is Australian.